Posted by Tomboktu in A co-op bank. One very useful, sane and practical thing ICTU could do, and they’re probably the only organisation in Irish society with the resources to do it, is set up a co-op bank. I would be interested in trying to pursue that suggestion, and in response to sonofstan’s comment said I would try to turn it into a motion for my union branch AGM in the next few weeks. I turn to you, CLR readers, for help with this. Have a significant paid-up share capital. The documents available from IFSRA indicate a requirement for IR£5m paid up share capital – this amount has remained unchanged for more than 20 years. IFSRA has powers to amend this amount, and reflecting the change in the value of money in the intervening period, this author is of the opinion that the amount required now would exceed €10m. Ensure that there is no dominant shareholder among the group. Any shareholder holding more than 5% would be subject to exceptional requirements. The dominance rule refers to immediate connections of the shareholder. In practice, the holdings of a husband, wife, and children are considered together for calculation of dominance. In practice, the dominance rule suggests that a minimum of 20 shareholders are required, while conforming with the dominance requirement. Board members must be undoubted, and have suitable experience and skills, and IFSRA reserves the right to approve (or reject) individual members. Ensure appropriate insurance or other guarantees for the fidelity of its staff. Conform at all times to a range of financial ratios including specified capital adequacy requirements, liquidity ratios, etc. The above list is far from complete, but indicates the nature of the most significant requirements. It is clear from this that Congress could not own a bank by itself, but that would not be the purpose of a co-op bank anyway. Getting people with the relevant skills would probably take a bit of work with a new bank, but I would be surprised if it were impossible. It might be difficult for Congress to do that, though. I think the most sensible approach for the coming union conference season would be trying to get Congress and individual unions to do preparatory work rather than jumping straight in with a set of motions instruction them to set up a new co-op bank. Second, what is the best way of getting Congress’s attention and involvement? Is it a request from one or two unions at the Congress executive for the establishment of a working group to explore the idea or is it a motion on the floor of the biennial delegate conference? And third: am I missing anything essential? Your thoughts on this, fellow CLRers? Posted by Garibaldy in Sport. Good to see a bit of industrial militancy. Even if it’s from a bunch of multi-millionaires from Serie A. Likely to have more success than the 100,000 on the streets of Dublin perhaps. Many thanks to Mark P for the following report from what sounds like a very positive and useful event. Apologies to all for the delay in posting this up. 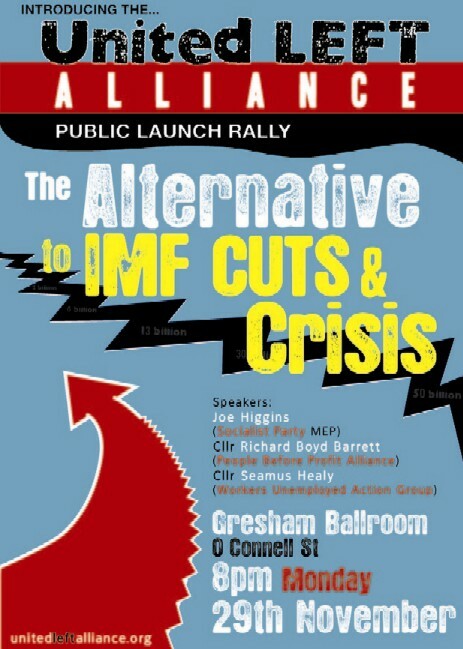 The United Left Alliance (ULA) was launched last night in the Gresham Hotel, Dublin. The Alliance consists, at this stage, of the Socialist Party, the People Before Profit Alliance and the Workers and Unemployed Action Group. Around 350 people filled the ballroom, despite terrible weather conditions. I have to admit that at about ten to eight I was a bit concerned that freezing cold and snow might have damaged the attendance, but the room filled up very rapidly after that. There were many faces familiar to me, supporters of the Socialist Party and the PBPA, but also many people I’d never seen before. A four page leaflet, containing the founding political basis of the ULA was distributed to those in attendance. The leaflet also contained a lengthy pledge to be signed by all ULA candidates, committing them not to take part in junkets at the public expense or to profit from expenses fiddles. The meeting was chaired by Ailbhe Smyth, a prominent feminist academic and convenor of the People Before Profit Alliance. Also on the platform were Richard Boyd Barrett, a PBPA councillor and SWP leader, Seamus Healy, a WUAG councillor and former TD, Cian Prendiville, an SP activist from Limerick, Joan Collins, a PBPA councillor, and Joe Higgins, Socialist Party MEP. Unfortunately, I don’t have notes of precisely who said what during their speeches. Hopefully other people who were there can fill in some of the detail on that score. Richard gave an outline of the political and economic crisis facing Ireland, and talked about the kind of attacks Irish workers could expect on their living standards. Both he, and later Joe, emphasised that the ULA as it stands is only a starting point. Cian was introduced as one of the youngest if not the youngest candidate of any party in the forthcoming General Election. He spoke very well, emphasising the effect that the crisis will have and is already having on young people and talking about the impact on Limerick City. He also took some time to ridicule a certain Labour Party councillor who put out a red-scare press release expounding the glories of the market this week. Seamus Healy explained that he wasn’t going to repeat the political points made by other speakers at length, and instead focused on the story of the Workers and Unemployed Action Group. The WUAG, which was founded in 1985 by a small number of trade unionists, has built itself into a position where it has 5 out of 12 councillors in Clonmel, 2 South Tipperary County councillors and a new councillor in Carrick on Suir. They are central to every community campaign in the region. He emphasised that this showed the kind of possibilities that were open to the left in towns and villages across the country. Joan Collins had just returned from a Dublin City Council meeting where the Labour/Fine Gael majority had just passed estimates involving huge cuts – just a taste of what’s to come. I’m afraid that I had to leave the room for part of Joan’s speech and so didn’t hear all of the rest of it. Joe Higgins was the last of the platform speakers to speak. He spoke about the bailout and austerity, about the “lifeblood” being sucked from the working class of this country to “fill the bellies of financial vampires.” He argued that crises and chaos are an inherent part of the capitalist system and advocated the democratic control, on an international basis, of the financial system. He particularly emphasised the need for a European and international perspective, arguing that just as the capitalists and financiers organise internationally that we need to link up with the workers of Greece, Portugal, Spain etc who are or will be facing similar attacks. He also said that the ULA was a starting point, a step towards a goal of a new mass party of working people and of the left. All of the speakers were also sharply critical of the Labour Party and Fine Gael, pointing out repeatedly that a FG/Labour government will be fundamentally no different to the current one. Each of the platform speeches were very well received. When the meeting was thrown open to the floor, dozens of hands went up, so although the Chairperson did sterling work keeping things moving, only a minority of those looking to speak actually got in. Speakers from the floor variously volunteered to raise funds, welcomed the new initiative and made suggestions of various kinds. Unfortunately, my lack of notes is even more telling here and I really don’t know who said what. Questions were also asked about corporation tax, about whether other groups such as the Workers Party would be involved, and about moving the next national meeting forward. Finally Joe Higgins returned to the podium to briefly respond to the discussion. He answered the questions asked and then he went on to outline what he saw as the role of any ULA candidates elected as TDs. He talked of them helping to give voice to movements in the streets and in the workplaces against the cutbacks and of using the positions to mobilise people to defend their livelihoods and communities. After the meeting finished, a lot of people stuck around for a drink. The mood was very good. People at the meeting were angry but felt that the ULA offered a way to do something about it. Two of the people I was chatting to had never been to a political meeting of any kind before, which was an encouraging sign. In a way the Donegal South West byelection, coming as it does after the EU-IMF intervention, is an interesting straw in the wind as to the future shape of the polity. Not too obvious in terms of the outlines though, as no end of people were making clear following the result at the weekend. Donegal South West isn’t the rest of the country. No indeed. It’s not. But it provides an opportunity to examine how various dynamics may play, particularly those extant outside Dublin. For Fianna Fáil seeing the constituency where the Tánaiste resides have a drop from 51 per cent to 21 per cent must be a clear indication of their fate. If there, then where else? And if replicated, then seriously bad news for the state of FF post February or March 2011. And even if one seeks to factor in Pearse Doherty’s persona and the hard work of him and his team, the halo effect for Sinn Féin of the Border (I know I’ve half-joked that SF is similar in some ways to – say – the German CSU, a party effectively restricted to a region, but really who would doubt that following the next election they will be returning at least four TDs from those counties), the court case which was an absolute vindication for SF and a raft of other lesser elements that provided the blocks that built this victory one is still left with the conclusion that there’s not much cover for them to hide away from. That’s something to consider. Because FF has, as indeed have most other parties, lived or died by transfers. And in recent years it had one particular support in that respect which is now gone, that being the small but not entirely insignificant drift from the Progressive Democrats. Their absence as a political force is likely to have a number of interesting outcomes in the next few months (by the way, does anyone know if Mary Harney is running again? And what of Fiona O’Malley?). Connolly notes that FF was reassuring its supporters that they’d not sunk to the 17 per cent of the recent Red C poll. Hmmm… well. Yes. And no. Given that that was a national figure in the Red C poll I think that dipping as low as 21 per cent in a largely rural constituency might well give pause for thought. A further straw in the wind is that polling the week before saw Doherty on 40 per cent and O’Domhnaill of FF on 19 per cent. A two per cent understatement, though naturally voters could have changed their mind in the interim. If the understatement of FF’s fortunes is in the 2 per cent range they’re in deep trouble either way if that is true nationally. I’m not suggesting for a moment that there’s a consequent dip lower in urban constituencies that would provide some sort of balance, merely that this is very very poor indeed and may represent indications of the post-EU/IMF dip some of us have anticipated. Or it may not and may simply be a condition of the constituency itself on this election outing. But I’d tend to think that FF is looking at much worse to come than has been before. It simply can’t walk away from the EU/IMF intervention in the way that it has done from other decisions (think back to Brian Lenihans, to some of us, inexplicably strong economic reputation in the past year or so before things turned sour – inexplicable because many of the most wrongheaded decisions had his fingerprints on them, so to speak. Granted a lot of that was along the lines of ‘we want a saviour’… but even so). For Fine Gael disappointment. 18.6 per cent is nowhere near where they will have wanted to be. But as the SBP notes sitting FG TD Dinny McGinley has said that he’ll run again, apparently, so no change there. The FG challenger, Barry O’Neill was saying that the Green pull-out/sort of from Government was the reason why the byelection didn’t go his way, as voters registered their dissatisfaction with the government by voting in Doherty in larger numbers. Maybe. Maybe. Maybe not. There’s also angst for the Labour Party whose Frank McBrearty barely got 10 per cent, coming in behind Independent Thomas Pringle. That 10 per cent might well represent a three fold increase for Labour, and their best result in years, but it’s not exactly the stuff of which a red, or is it pink, tide are made of. Can’t help feeling though that Labour are squeezed in this particular instance in a constituency that has proven resistant to their blandishments. The Pringle vote is interesting though. That’s an impressively high showing for an Independent – who to judge from his electoral material was left of centre – one wonders are others looking at it and calibrating their own future electoral prospects accordingly. Pringle’s own history doesn’t provide perhaps quite enough clues to say for sure whether this is a dynamic that may be operative elsewhere. But if it were, and if Independents were able to capitalise on the collapse, or significant reduction of the FF vote, then the shape of the new Dáil may be somewhat more variegated than hitherto anticipated. It also has implications for ULA and independent and smaller left parties. Potentially positive implications. So much depends, obviously, on where the Fianna Fáil vote as was is going. Clearly in this instance it went to SF – largely. But if it’s also going more to Independents rather than, say, Labour – and with the caveat that this is probably a dynamic more in operation outside of Dublin, then that has significant implications as to their presence in the future. And it may demonstrate that those formerly FF voters will go a couple of steps, even towards Independents, but may find going a couple of steps more to Labour more difficult. Again, I don’t want to overstate this. The local conditions may have shaped that outcome more than can be determined. And so to Sinn Féin. Not hitting the quota, but not needing to either. Back up to five TDs, their 2002-2007 tally. Able to dispel in part the mutterings in the 2007 period and after that they had done as well as they could do and were now in something of a retreat. This, remember, was one of the seats tipped for them to do well in in 2007. That it took a further three and a half years suggests both the optimism of the original schedule and the need to work hard on the ground to expand the vote. Which contains a lesson for those presently incumbent SF TDs. This has to point to one or two gains in the next election, or perhaps more if that FF collapse occurs more widely. But it also points to a reality that was for far too long ignored, particularly in the case of SF – but also more widely abroad. Political progress is a slow and painstaking process. It’s filled with defeats and setbacks and only occasional victories. Winning seats is hard. The first time an SF candidate contested the seat was in 1987 and then they gained a mere 4 per cent of the vote (something I’d forgotten until I went looking at the stats was that Séamus Rodgers of SFWP and later WP and later still of DL won up to 9 per cent at various elections through to 1992, later still as the LP candidate – and as recently as 2007 – he received in or around 3 per cent at successive elections. Interesting to reflect on where at least some of the larger vote went to). Of course all this may crash and burn elsewhere, but certain dynamics are of interest. The positive SF result is clearly of significant benefit to them elsewhere. Amusing to see Gerry Adams in every photo, as was indeed his right. And sensible too given the situation ahead. Clearly his shift South hasn’t impacted negatively so far and may in fact have further assisted in raising the SF profile, something that will be of benefit to many of their candidates. For the LP, more to do. Much more. For FG, hold the line, and for FF try to determine where the line actually is. Meanwhile, one small thought. If the next government last five years – another not entirely likely outcome, but not beyond the bounds of possibility – well then, we’re looking at Election 2016. Crushing symbolism and of a sort that might not be to the taste of Fianna Fáil one little bit when the day comes around. The imposed “solution” to the Irish state’s growing and deepening crisis is to make every person an indentured servant to the needs and interests of EU finance houses, in particular to German banks. The National Pension Fund is now to be squandered to bail out banks that should have been allowed to go to the wall from the beginning. The punitive interest rate of 5.8 per cent is unpayable without enormous hardship being inflicted on the people. There is no other solution than to repudiate this unpayable debt. It is clear that the Irish establishment put up little if any resistance to the demands being imposed by our so-called “partners” in the European Union. These are the same people who negotiated the Lisbon Treaty while admitting that they had not even read it. The dependent relationship with the EU that all three main parties have pushed our country into over the last four decades is now being laid bare. They have now put the interests of saving the euro and German bond-holders before those of the Irish people. in general, need to think again. Yet words of verse are no consolation for young professionals apprehensive of the future and the burgeoning middle classes that now dominate the dole queues and emigration lines. Michael Taft wrote the following which neatly frames the UNITE letter to Opposition Party Leaders. UNITE and Kelly have been particularly activist in combating the measures implemented or proposed by the Government. The letter itself makes a case that all progressives and leftists should be well able to support. (b) Ring-fence the cash and assets available to the state in the National Pension Reserve Fund and the National Treasury Management Agency’s cash balances. These should be used for economic and social investment only and not to pay off the deficit or write-down debt. On behalf of the UNITE trade union, I am writing to ask that your party declare they will not be bound by the agreement reached yesterday with the EU and the IMF. This agreement is not in the interests of the Irish economy, Irish workers or the Eurozone. (2)	The cash and assets held in the National Pension Reserve Fund and the National Treasury Management Agency’s cash balance will be ring-fenced for public investment in the Irish economy. These resources will not be employed for deficit or debt reduction purposes as this will only undermine our ability to generate growth and employment and, so, defeat the objective of repairing our public finances. UNITE believes that only by removing banking debt from the public balance sheet and employing our cash and assets for investment purposes can we hope to achieve economic recovery and fiscal stability. I look forward to receiving your response which I will pass on to our 60,000 members in the Republic.